It was out of respect to my employer, who bought the ticket and sent me to Siberia to shoot on-the-fly videos, take photos and write stories about these incredible destinations that are my employer’s expertise for 30 years, and as they say – “at the crossroads of Europe and Asia.” I loved using my Russian and meeting so many Siberians who adore this diverse land. I think I made the right decision, waiting for some time to pass so my employer would reap the rewards of all the publicity and marketing of my efforts before I diverted attention by re-posting on my own personal web sites and on Facebook. This first video was the most complex, with multiple angles and two separate trips with the Siberian conductor to get the shots I needed in a very short time. 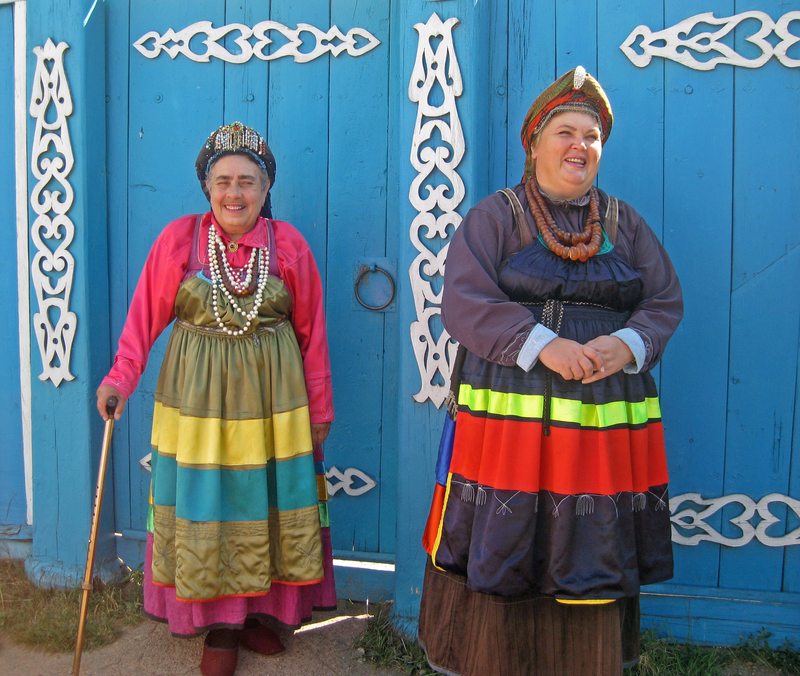 I shot two videos of the Old Believers (Староверы), having just traveled 45 hours from Seattle to L.A. to Moscow to Ulan Ude, and then by bus to Tarbagatay. Pretty jet-lagged! It was wonderful talking to them in Russian, and hearing their stories of religious persecution. I was quite surprised at how much viewers like this “on-the-fly” video I put together of a visit to a Soviet apartment in Irkutsk, and having tea with Tatiana. Finally, no story about Siberia is complete without listening to Russian Orthodox Church bells. I caught this on a summer Sunday morning in Irkutsk, just as church services were ending. I’m grateful to my employer for giving me the gift of Siberia – a place I could only dream about growing up, and read about in my Soviet studies. I will never forget the people and places of this complex, pristine, and intriguing land… Большое спасибо! Tags: church bells, Golden Eagle luxury train, Helen Holter, Irkutsk, Old Believers, Russia, Siberia, Stalin-era apartment, Tarbagatay, Trans-Siberian Railway, Ulan Ude, video. Bookmark the permalink. Immersed in the Northwest's jaw-dropping beauty, technology, and generosity, Helen lives and works at the cutting-edge of digital and broadcast media, sharing with others along the way. An Emmy-winning former TV news journalist in Seattle and Russia, Helen loves Seattle for its "spirit of place," especially in the outdoors, technology, global health, and – yes! – great coffee! Here lives the quirky intersection of old and new, past and future – Helen's home, Seattle. © 2019 Helen Holter – All Rights Reserved. No photos, videos, or content may be used without prior written permission. Welcome to Seattle, Journalists from Uzbekistan!